SYNOPSIS: Exploitation account of a cop hunting down a serial killer. It's no big secret that the killer is a white man who wears an afro wig and blackface when he commits his horrible crimes. He's unhinged much like the Dirty Harry psycho "Scorpio". He blows people up, sniper kills them, throws them down stairs, etc. 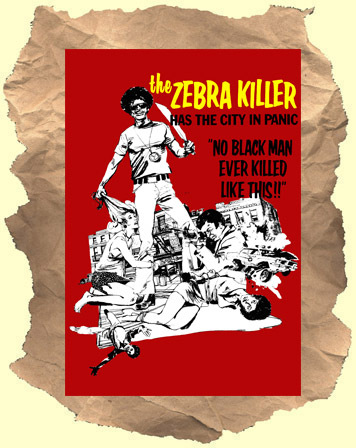 No nonsense cop Austin Stoker is obsessed with catching the so-called 'Zebra Killer'. Especially after he kidnaps and rapes his girlfriend! This movie is pure exploitation from genre vet William Girdler. Unfairly left to out-of-print PAL videos on savvy collector's shelves. Never released on home video or dvd in the U.S. Check it out! Note: onscreen title is "Panic City"